Dickensware pieces by Royal Doulton were produced, based on the writings of Charles Dickens, from 1911 to the early 1940s. 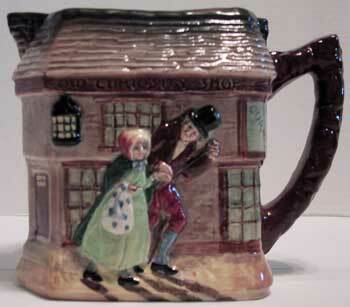 This vintage (1941) pitcher from Royal Doulton, "The Old Curiosity Shop", stands 6.5" tall and depicts two characters from the Dickens classic, the elderly English Gentleman and the lost child, "Nell", leading her back to the "The Old Curiosity Shop". Item is decorated on all sides. Authentic Royal Doulton hallmark, serial number RN809560. In 1872, the "Royal Doulton" mark was used on all wares from the company. 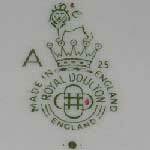 The Royal Doulton mark has been used since 1902 and is still in production today. In 1912-13, Charles Noke launched a new group of Royal Doulton figures. The first figure was HN1, "Darling" in honor of Queen Mary. Beginning in 1913, a HN number was used on all wares. This HN number refers to artist/designer Harry Nixon of Royal Doulton. Harry Nixon was an artist in charge of painting the figures. Other artists included John Sparkes, George Tinsworth, Arthur Barlow, and Agnete Hoy among others. The HN numbers were chronological until 1940, after which time blocks of numbers were assigned to each modeler of the figures. From 1928 to 1954, a small number was placed to the right of the crown's mark on all items made between those years. This number (the one at the right of the crown's mark) when added to the year 1927 will give you the year of manufacture of a particular piece. The letter A to the left of the crown was a mark added to pieces between c1939-1955.